Mood lighting, home automation and 12v low voltage lighting systems enhance the beauty of your home and make it easier to control. Buy with confidence from H3 Digital, The Smart Home experts in Thailand. Smart Homes - Bring out the beauty of your home with easy to control mood lighting and home automation. 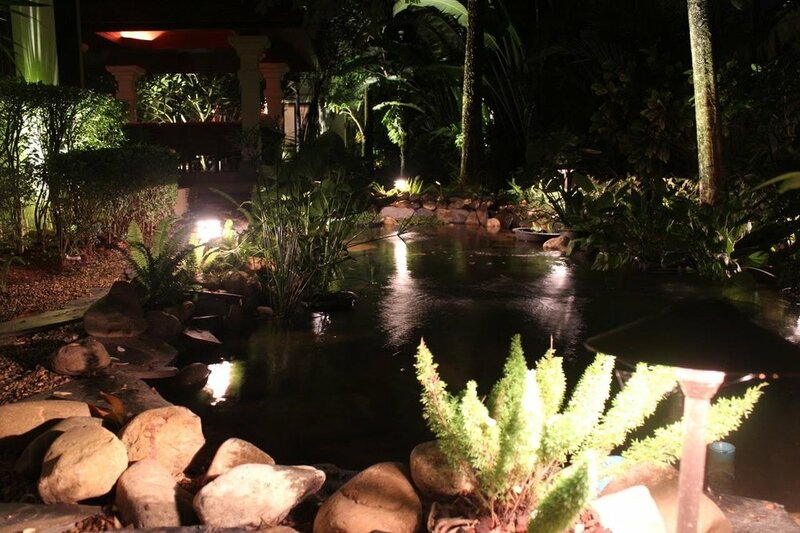 Light up outdoor living areas, paths and landscape with safe Low Voltage outdoor Lights. Automate control of your home instantly at the touch of a button, voice command or schedule. A Smart Home makes life easier, safer and more comfortable. Lighting control is used to make your home more comfortable, making life easier by automating and simplifying routine activities otherwise known as Home Automation; like switching on groups of lights, setting mood lighting, dimming or turning off all the lights in your home automatically. Low voltage lights are the safe option for lighting up the garden and outside of your home in a dramatic, elegant way that just invites outdoor living. 12V lights, lamps, fittings and fixtures ensure that your outdoor areas are safe for you, your children, your pets and the gardener. LED lamps and bulbs ensure years of use without having to replace the (user replaceable) lamps. Do you want a Smart House? If so Scroll down to read about Philips Hue and KNX. Scroll further to learn about our lighting design process, previous lighting control installs in Thailand and our Smart Home Lighting FAQ. We work in Thailand in Phuket, Chiang Mai, Hua Hin and Bangkok and in Myanmar in Yangon. I have had the pleasure to have Ben and his H3 Digital company work on my home and those of several of my friends in Phuket. The help in choosing the right equipment was invaluable and the installation both on-time and without any issues. More importantly the after sales service and support I received was second to none and not typical of what we expect in Thailand. Your personal Wireless lighting system. Philips Hue combines brilliant colourful LED light with intuitive technology to forever change the way you control and experience light. Smart controls from any device, wherever you are. Set timers, scenes and use Hue sensors to trigger lighting on presence. The Philips Hue ecosystem includes LED Bulbs, Strips, Lamps, Switches and Sensors. You can even issue voice commands via Alexa (Amazon Echo) or Geofencing. KNX is an international building control standard that enables the integration and programming of a range of products from many different manufacturers such as Jung, Gira and ABB. It is an Open standard. In theory hardware from manufacturers is interchangeable. However KNX is quite complex, it needs to be professionally programmed to make changes so end users won't be able to make changes themselves. We are fully KNX certified. Outdoor low voltage lighting provide a pleasant alternative to standard 220-240V lighting. Strategically positioned LED 12V Lights illuminate and accent the plants, walkways, trees and features you want to highlight. Safely light your landscape, all your paths, steps and dark zones. Our range of 12V Outdoor lighting includes specialised fittings, fixtures and cabling but uses standard 12V LED lamps for easy replacement. Soft, safe pathway lighting, dramatic uplights for your favourite trees, make entertainment areas come alive with bright, dramatic mood lighting. Low voltage lighting is the de-facto standard for safe, effective lighting outside - it's also beautiful. We use LED Lamps exclusively for their longevity and reduced electricity costs. Designing a lighting system for a home starts out with the customer, we listen and understand the moods you want to incorporate and your comfort level for home automation. At each step we bring our usual expertise, professionalism, and attention to detail - However it is mainly during the Design stage that this hard work points towards a successful project. We meet with you or your representatives and understand how smart you wd like your homes lighting to be and what sort of moods you wish to include. Our initial proposal gives you an idea of what to expect in terms of cost and timescales. A conceptual audio plan is drawn up, this non-technical drawing is used for further discussion and ideas. This is the final technical plan of your cinema. I engaged the services of H3 Digital to help design and install a home cinema with surround sound, dimming and lighting control and a Sonos music system for the whole home. Everything is connected nowadays, The IOT (Internet Of Things) makes it easy to control your home. Which rooms or areas would you like lighting control or automation, either the whole house, common areas or limited to single rooms. Would you like the lights to come on when you speak, arrive home or at certain times of the day. Will you stick with conventional switches but Smart Bulbs or a Lighting Control system with its own special switches. Control systems help to bring interconnected devices together and often give you a single app to act as a gateway to your home. Learn more about what it is, what it signifies and how it will effect you and your home. We design and install Lighting Control Systems and Home Automation throughout Thailand including; Phuket, Hua Hin, Bangkok and Chiang Mai. 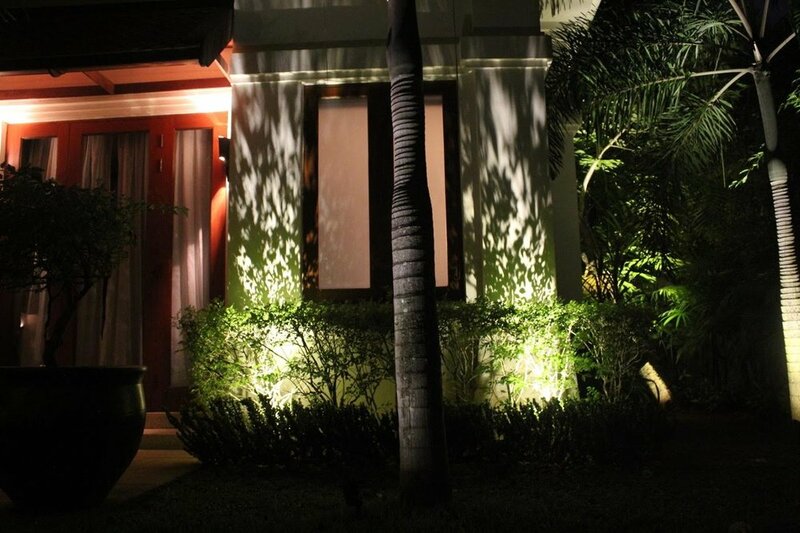 Below are some of the previous home automation and lighting projects we've installed in Thailand. What is a lighting control system? A system that gives advanced controls of your lights. 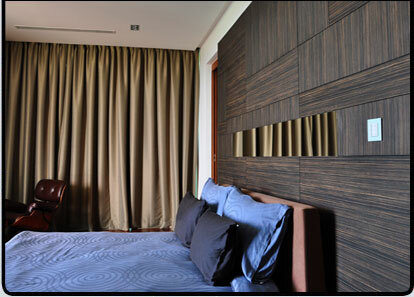 For example dimming, mood lighting, colour changes and grouping of rooms and areas together. This can be through either smart bulbs (as in Philips Hue) or built into switches or actuators in racks (KNX). controls can also be automated (Home Automation) so that for example; lights can be automatically turned on or off in the evening. What's the best way to light the outside of my house and garden? Low voltage lighting is the safe standard for outdoor and landscape lighting. With a 12V lighting system (lights, lamps, fixtures, fittings and cable) there is no risk of electric shock to children or animals if the cable is damaged, or gets wet. Can I just get get my electrician to fit the smart lighting or 12V low voltage landscape system? No, It's really beyond the standard level of electrical installations we see in Thailand and SE Asia. Your electrician won't have the specialist knowledge, tools or fittings to do the job properly. Either with your phone, keypads or voice for Smart Bulbs. With hard wired lighting control systems you will need special light switches that take place of conventional ones but can also use your phone or tablet. Home Automation means that you can set up your home to automatically control itself based on triggers (timing, sensors etc...). Can I really control my lights with my voice? Yes with either Amazons Alexa, Googles Home or Apples Homepod/Homekit (Siri) equipment you can easily control your Philips Hue lighting system with a voice command. "Alexa turn on all my lights", "Google turn my living room lights down", "Siri dim the outdoor lights". You can also call up scenes, easily set up IFTT (If This Then That) style smart home scenes and automated actions. Can I retro fit lighting control into my already built house? Smart Bulbs like Philips Hue - Yes easily, Hard wired lighting control system - No, definitely. Yes, we can program the systems to be as simple or sophisticated as possible, The Philips Hue and other Smart Bulbs are the simplest to use. If you want something very sophisticated or very large such as a hotel smart lighting system or large building control then a full lighting control system would be recommended. Does it work properly here in Thailand? Absolutely, although extra care has to be taken when planning wired lighting systems here in Thailand to make sure that all the cabling is done properly. The Amazon, Google and Apple smart home lighting apps and equipment may need special installation as the latest kit isn't always available here in Thailand, so we may have to sideload the apps. Can I turn my homes lights on and off when I'm not there? Yes, that's a built in feature of modern smartbulbs, via say the Philips Hue app you can trigger any lighting scene, individual or group of lights to turn on/off or change colour, dim etc.... For a lighting control system you will need an IP module. If you have Amazons Alexa, Google Home or Apple Homekit or other smart home hubs (Smartthings, Wink) then it's easy to set up complex (or simple) automation and mood lighting. Home automation or 'Domotics' is whereby other appliances are integrated into the Smart Home. 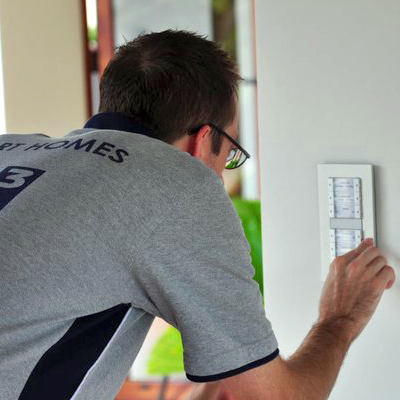 For example fans, air-conditioners, sprinklers and blinds can all be controlled from the lighting keypads or phone app. What is a presence detector? Presence detectors turn on lights and fans as you enter the room and turn them off when you leave, timed events can turn on/off your lights and raise/lower motorised blinds at a specific time. Can I control it with voice? Sure - especially so for the smart bulbs and any IOT connected devices, you can use Siri, Alexa or Google Home to issue commands to your home. For example "Siri, please turn on all my lights" would turn on all your lights. Smart Bulbs are available individually - they just screw into existing fittings - so you can start small or just get coverage exactly where you want, lighting control systems are wired in so you will need to build them in from the start ideally, either for the whole house or common living areas. We've built systems ranging from 40,000 Baht for a room up to lighting control for the whole home which generally falls into the 300-850,000 baht range.